War crimes tribunal judges have ruled that Congolese warlord Thomas Lubanga should not be freed but say his trial remains suspended. 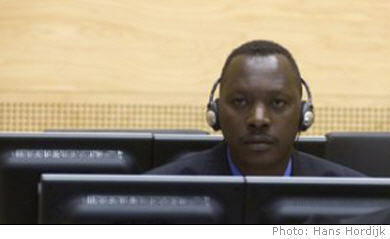 Correspondents say the International Criminal Court (ICC) ruling leaves Mr Lubanga in legal limbo. Mr Lubanga was arrested in 2006, accused of recruiting and using child soldiers during DR Congo's brutal five-year conflict that ended in 2003. His case would be the first ever to come to trial before the ICC. The judges dismissed a prosecution appeal against the decision to halt the trial in June but said a further hearing was needed to decide whether he should be released. "The trial chamber was wrong in finding that the inevitable consequence of the decision to stay the proceedings was his unconditional and immediate release," said presiding judge Sang-Hyun Song. The case was halted in June, just a week before the trial was due to start, after judges accused the prosecution of withholding evidence from the defence. Some 200 documents had not been handed over and the judges said this meant a fair trial was not possible. Four million people are estimated to have died during the conflict in the DR Congo. Mr Lubanga led the Union of Congolese Patriots (UPC) militia in the north-eastern Ituri district, around the town of Bunia, where fighting continued long after the official end of the war. In a statement released early last year, the prosecution argued that children had been snatched as they walked to school and forced to fight for Mr Lubanga's ethnic Hema militia against their Lendu rivals. The child soldiers were later instructed "to kill all Lendu including men, women and children", the prosecution statement said, based on testimony from six children. Mr Lubanga denied any wrongdoing. His lawyers said he was trying to end the conflict and is being punished by the international community for refusing to give mining concessions in areas he controlled to foreign firms. The ICC, based in The Hague, was set up in 2002 as the world's first permanent war crimes court. It was designed to end the need for various ad hoc war crimes courts - including the chambers created to deal with war crimes committed in the former Yugoslavia and the genocide in Rwanda.